We are both very happy to be able to tell you that our new deck vests arrived today in the post! These have been kindly donated to us by James at Spinlock, and have come highly recommended by everybody that we have spoken to as the best on the market. Hopefully we will never have to use them, but it’s better to have and not need than need and not have!! This entry was posted in Uncategorized and tagged spinlock on February 13, 2014 by Darren Taylor. And for those of you who haven’t already seen the photo’s on Facebook, these are the pics of our boat being born!! 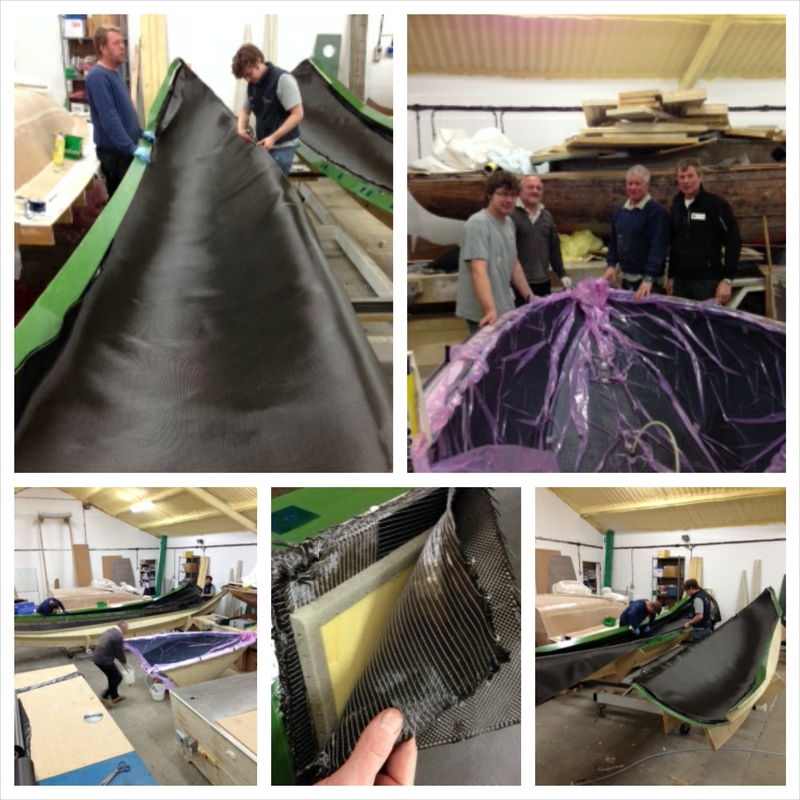 Charlie Pitcher and the guys at Rannoch Adventure start putting down the first layers of carbon fibre into the mould, creating the very beginning of the boat that will carry us safely across the Pacific!! 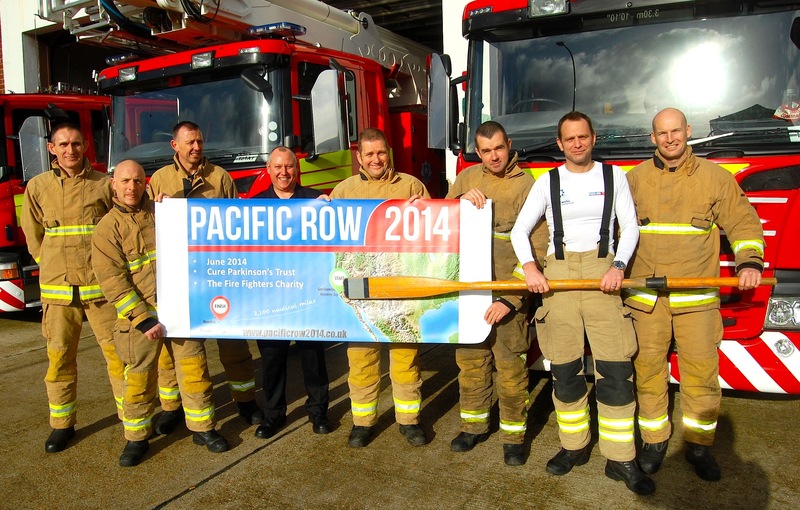 This entry was posted in Uncategorized and tagged pacific row, rannoch, row the pacific, roz savage on February 7, 2014 by Darren Taylor. I went to meet Professor Helen Dawes from Department of Sport and Health Sciences – Oxford Brookes. What they are doing is amazing, and I won’t even try to explain. I have taken a video instead, letting her talk about the work that they do, and why we are very happy indeed that we have met her and her wonderful team….. This entry was posted in Uncategorized and tagged oxford, oxford brookes, pacific, sport and health sciences, university on February 5, 2014 by Darren Taylor. A busy few days, with both highs and lows. Had a really good chat with Jim from Mactra Marine Equipment, who are supplying our electric and hand operated desalinator that will provide us with freshwater during the crossing. Jim lent one to one of the competitors in the Talisker Whisky Atlantic challenge, and should have it back in his talented hands now. He will service and test it before sending to Charlie at Rannoch Adventure to be fitted in the boat. Jim is a great guy, and very supportive of what Alex has already accomplished. He is also going to give both of us a tutorial in how to maintain both desalinators, so that we will be able to repair them should anything go wrong while at sea. I had a chat with Joel from OverBoard – The Leaders in Waterproof Bags & Cases, and they have also come on board as product sponsors, providing different types of waterproof containers/bags to protect all the different gadgets and gizmo’s we will have on board. I met Joel at the London Boat show, and Overboard are also helping out Team Boatylicious with gear as well. It’s great to find another company that believe in the sport of Ocean rowing, and are happy to support those who are adventurous enough to try it!! On Thursday evening I had a meeting with members of The Oxfordshire Project in Witney. I have spoken about this group before, and how much I enjoy being involved with them. They are a collective of Oxfordshire based businesses/companies, that believe in operating in an ethical manner, and I have always come away from their meetings feeling good. Ben Molyneux, who started the collective and has been a great source of help and information, has brought together a group of like minded people from within the project to try and start a charitable arm of the Oxfordshire Project, with the aim of helping lots of different causes in whatever way that they can, while also helping people learn new skills along the way. This entry was posted in Uncategorized and tagged overboard, oxford brookes, oxfordshire project, pacific, pacific row, row, row the pacific, witney on February 1, 2014 by Darren Taylor. Today feels like the beginning of the hard slog to the start of the Race. I went to meet Professor Greg Whyte of www.chhp.com , who are based in Harley Street. Greg had been recommended to me by Charlie Pitcher, the guy responsible for building our boat, and who also happens to hold the world record for the fastest Atlantic solo crossing in a rowing boat. The video below is of that first meeting, and in it Professor Whyte explained to me his background, so that I could understand where he is coming from. I won’t go into everything that he talked about, you can watch the video for that, but suffice to say that he is a huge asset to have on board, having worked closely for two Olympic games with the team GB rowing squad, been an Olympian himself, competing in the Pentathlon, and also working with the likes of Eddie Izzard, David Walliams and John Bishop (to name a few…) when they took on their own endurance challenges to help raise money for charity. I was invited to come back today to take a cpex test. This is where you are monitored at different levels of physical exertion to see how your body is responding to the various demands being asked of it. I have to say that I was looking forward to it and dreading it in equal amounts, as I knew that it was going to be hard, but it needed to be done so that the results can be analysed and a bespoke training programme put together that will have me at my best come the start of the race. It has always been Alex and my intention to win, as this will give Alex more exposure to promote the benefits of exercise to those who are living with a chronic, degenerative neurological disease, and the training programme will help us to achieve that. The video shows the cpex test, it wasn’t as bad as I thought, but that may be because I didn’t put enough into it! Taking this test now means that we have entered the final stages of preparation, training wise at least, and I can’t wait to see the results and what the training programme is. Greg has promised that it’s going to be brutal, and that I will probably end up hating him, but there you go!! We are still working hard at raising the much needed finance for everything that goes hand in hand with Ocean rowing. It’s such a huge task, and I think that both Alex and I have high and low moments. Luckily, we have an amazing group of people that are on this journey with us, and between them and each other, we always pick ourselves up and get back into the groove fairly quickly. This is an amazing challenge that we are taking on, and if we ever start to waver, we just stop and think about all the positives that are going to come out of it. I am immensely proud that I am the person that will be joining Alex in this Race, and if I ever start to get down about the workload that we have chosen to place on ourselves, can someone please give me a (gentle!) slap to remind me that it is nothing compared to what some people have to live with every day. This entry was posted in Uncategorized and tagged Atlantic, Charlie Pitcher, David Walliams, Professor Greg Whyte, Professor Whyte, Talisker Whiskey Atlantic Challenge on January 31, 2014 by Darren Taylor. 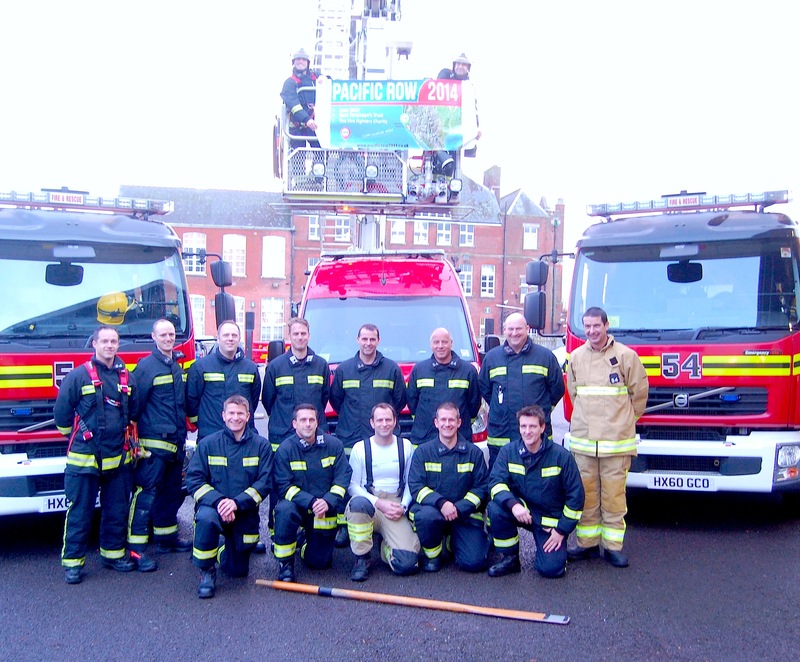 A big thank you to the Firefighters of Southern England! This entry was posted in Uncategorized on January 22, 2014 by Darren Taylor. 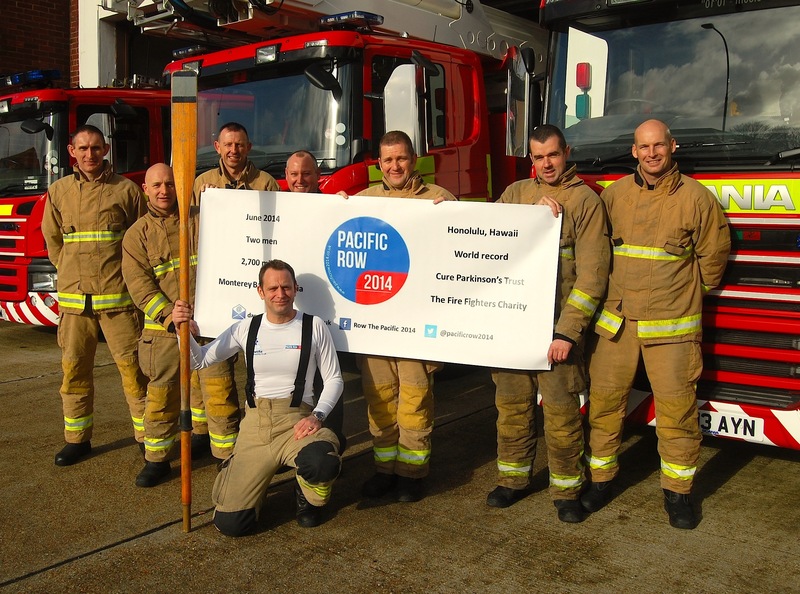 The Pacific Row 2014 story starts a year ago today. That’s a lot to catch up on, but I will try and fill you in with all the major events that have occurred since then as I go along. When I was 11 years old, one of the friends that I made at school was Alex Flynn. We got on pretty well, but it was only when we both attended Henley College together that we became good friends through a love of rock music and long hair. We hung out a lot, listened to music, talked about girls and eventually got a band together, with Alex as the front man and me playing the guitar. It was a great couple of years, and we had some really good times, but after I was asked to leave Henley for the second time (that’s another story…), we drifted apart and I didn’t really hear about what Alex was up to for many many years. Alex came back into my life through Facebook. I was not a great social media user, but on one of the rare occasions that I was online, I saw Alex’s name on a mutual friend’s account, and decided to see what he was up to these days. What he was up to, in his own unique way, was dealing with the fact that he had been diagnosed with Parkinson’s disease in 2008, at the age of 36. The way that he was dealing with it was by running his own campaign, called 10 million meters (www.alexflynn.co.uk), to raise the public’s awareness of the disease as well as funds for the Cure Parkinson’s Trust. The idea behind it was to run, walk, cycle, climb and even crawl, if need be, 10 million meters in accredited endurance events between August 2009 and January 2014. I couldn’t believe some of the things that he had achieved. 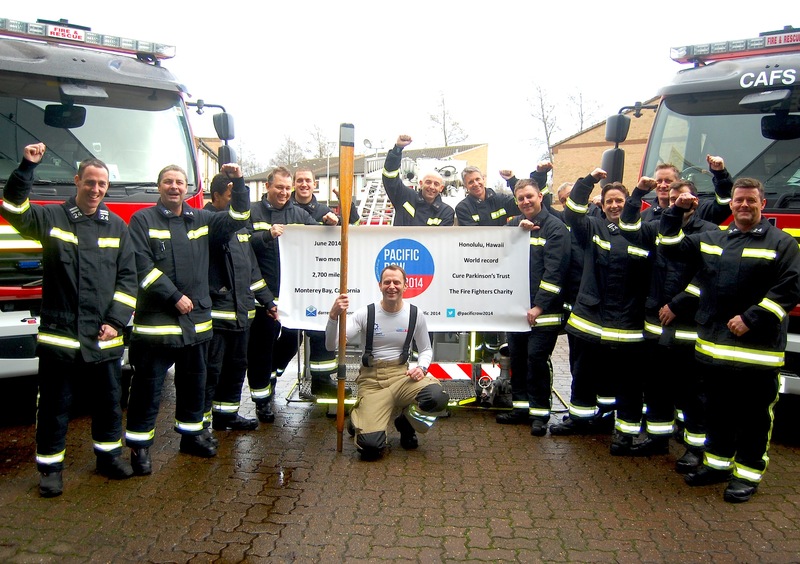 In June 2011 he ran from London to Rome (1,457 miles) in 30 days. 30 days!! The first 10 days he was running 2 marathons back to back. Who does that? It gets better. In September he carried out his own Trans America Challenge. He ran, cycled, rowed and climbed 3,256 miles from the west to the east coast of the states, and he did it all in 35 days. As soon as I had read all this, I got in touch with Alex. It’s funny, I don’t remember saying anything about that I was sorry about his diagnosis, all we spoke about was what he had done, and what he was going to do. We kept in touch, and I soon decided that I wanted to take part in some kind of event alongside him. I came up with the Atlantic rowing Race. It was something that I had always wanted to do, and seemed to fit in well with the types of endurance challenges that he seemed to enjoy so much (The Talisker Whiskey Atlantic Challenge is often cited as being the toughest endurance race in the world…). I played around with the idea, and a year ago today, I found myself calling Alex while standing on the platform at Oxford railway station. I remember it was very frosty, and that I had just come off a night shift at work. I also remember thinking that I was already halfway to the start line in my own mind, so very excited about this plan of mine and how Alex and I were going to go on this great adventure together and help people to boot. 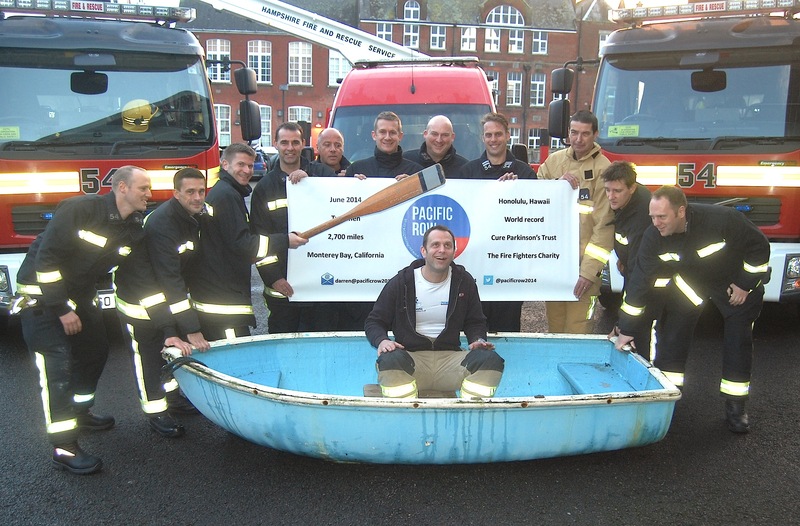 This entry was posted in Uncategorized and tagged 10 million metres, Alex Flynn, atlantic challenge, Darren Taylor, firefighters, Henley, oxford, pacific, parkinsons, row the pacific on January 12, 2014 by Darren Taylor.